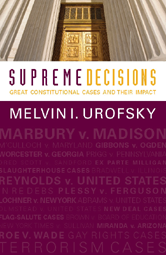 Supreme Decisions: Great Constitutional Cases and Their Impact covers twenty-three Supreme Court cases that have shaped American constitutional law. Interpretive chapters shed light on the nuances of each case, the individuals involved, and the social, political, and cultural context at that particular moment in history. Schenck and "Clear and Present Danger"
"Debate on Public Issues Should Be Uninhibited, Robust, and Wide-Open"
The Fifth Amendment’s "Great Right"